No Room to Store Your Boat or RV? Let Us Be Your Third Car Garage! 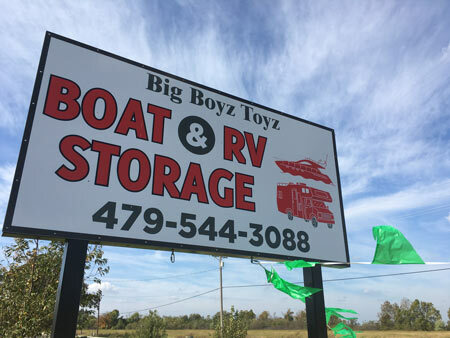 Big Boyz Toyz Boat & RV Storage aims to be the home away from home for your boat, RV, trailer, camper or power sports equipment. We offer customers 36 accommodating indoor storage units, as well as 30 outdoor spaces, giving you the perfect area to safely and accessibly house your toys. Our brand-new facility has 24/7 accessibility, so you can come check on your baby whenever you’d like! If your someone who loves the great outdoors, you’ve probably got a boat, camper, trailer or RV that helps you experience them to their fullest. You might even have several of these toys! The problem is finding a place to store them all when you’re not using them. At Big Boyz Toyz Boat & RV Storage, we understand that your garage or backyard might not offer enough space, which is why we provide the indoor storage units and outdoor parking spaces that do. We’re proud to be the premier destination for RV and boat storage near Springdale, AR. And, best of all, we’re located not far from some of the state’s best outdoor destinations, including Beaver Lake and the world-famous Ozarks! 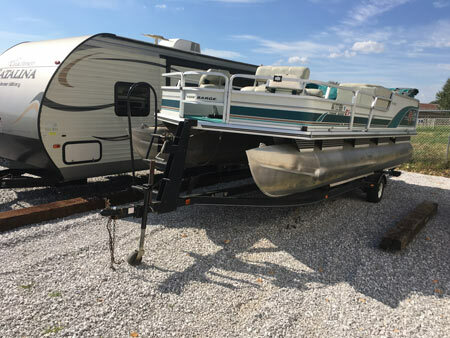 Customers choose us for boat and RV storage near Springdale, AR for a few simple, yet very important reasons. First, our facilities are completely safe. With restricted access to the general public, padlocked units and a well-lit campus, we take every precaution when protecting your property. Second, we’re accessible to those who rent with us! You’ll have 24-hour access to your toys, so you can check on them whenever is convenient for you. And finally, we’re committed to customer satisfaction. With flexible rental terms and rates, and a penchant for doing what’s right, we earn your trust by delivering uncompromising quality. Stop by our facilities today and see for yourself everything we have to offer you and your toys! Our facilities offer 36 full-size indoor storage units, as well as 30 outdoor parking spaces to house your various toys. All of our indoor storage units are equipped for power, with 30 amp outlets available in our RV units and 110 amp outlets available in our boat storage units. Our facility has 24/7 accessibility to key-holders, with safety and security measures to prevent intrusion or unlawful access. We’re just a few short minutes from Beaver Lake and the rural highways of the Ozarks. Our rental terms and rates are flexible and accommodating to your needs, based on what you’re storing and how long you’re storing it. Not enough room in your garage or backyard for your boat, RV or trailer? Reserve a space with us and store your toys with complete confidence and peace of mind! Inquire today about rates! "Great location! Service is fantastic, facility is new, clean, and easy to get in and out of. Rates are very competitive. Would highly rec..."
"Great rates and so convenient!"